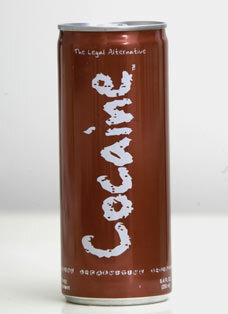 Anti-drug campaigners today attacked the makers of a soft drink who have called their product cocaine. The high-energy drink is being billed as a "legal alternative" to the class A drug, using a massive hit of caffeine instead of cocaine. Its maker claims the title is "a bit of fun" but critics slammed the technique as a cynical ploy which could tempt young people into using drugs. The drink's inventor, Jamie Kirby, said: "It's an energy drink, and it's a fun name. As soon as people look at the can, they smile." He claims Cocaine is "350 percent stronger than Red Bull" but that people do not experience the "sugar crash" or jitters that he says some of the other energy drinks can produce. But David Raynes, of the UK National Drug Prevention Alliance, said: "It is people exploiting drugs. It is a pretty cynical tactic exploiting illegal drugs for their own benefit." Las Vegas-based drinks company Redux Beverages is producing the drink which contains 280 milligrams of caffeine. According to the company's website, the only way to get more caffeine per ounce is with an espresso. Mr Raynes added: "The fact is that subliminally, it is making the image of drug use cool and that's what kids what to be, cool. "Kids will be drinking Cocaine and will inevitably link the two. The drink is relatively innocuous, but they will be linking it with cocaine use and the market, which is far from innocuous." Dr Charles O'Brien, a professor and vice chairman of psychiatry at the University of Pennsylvania, said: "It's just a bad idea and has all the same downsides of too much caffeine plus a very bad name." The company has received inquiries about selling Cocaine in Britain and throughout Europe. At the moment it is being sold only in the Los Angeles and New York metropolitan areas - mainly to teenagers.